Day 2 in Hong Kong started bright and early, even before the crowds, and the fresh bakery buns. Our bodies are slowly adjusting, and the 2nd night sleep was much better. We breakfasted at the good old golden arches, for hot cake sets and egg mcmuffins, for old time sake (well, like in Japan) and to fill the bellies for at least a few hours. 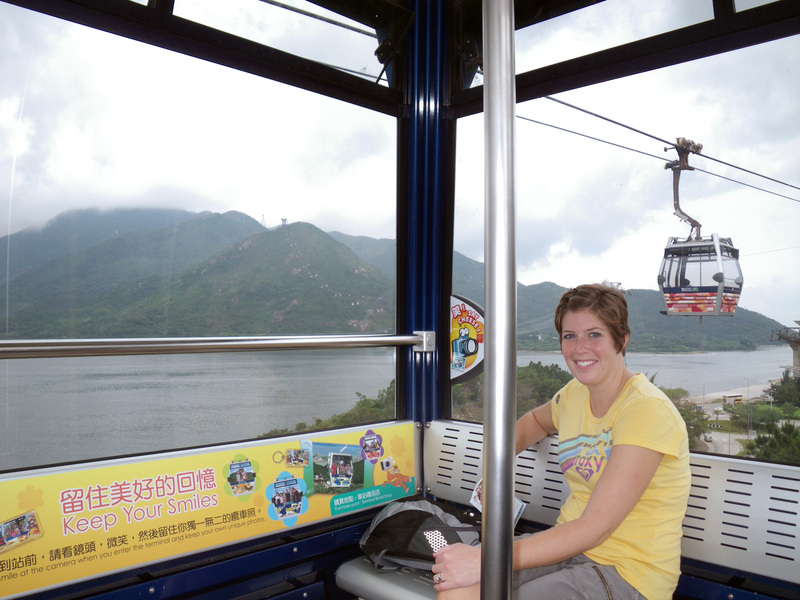 From there we did some MTR (metro) riding over to Lantau Island, and up the cable car. Neither of us are crazy about heights and perhaps that could have warranted some more thought before purchasing the round trip tickets for the 25 minute ride… at least we opted NOT to take the glass bottom version. 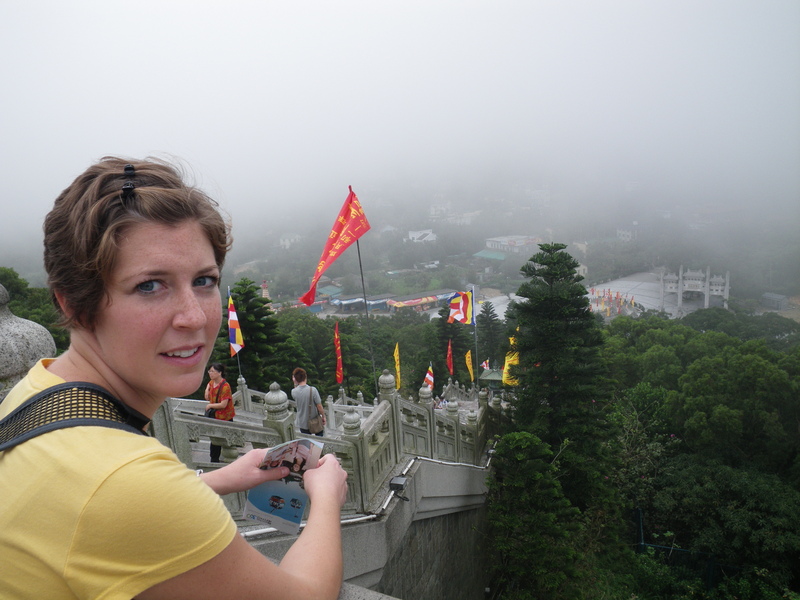 But at this point we weren’t sure about the other options and we sure weren’t hiking down. On side note, over the last 2 years, the number 17 has not been my friend. Unfortunate thingsto happen on this day of the month, and so I tend to avoid doing things that are important in relation to it. Call it superstition I guess but all the following things happend randomly, and so can’t be ignored. So, for this China trip, shortly after booking our flights online, we realize that flight 17 took us from Vancouver to HongKong. Excellent. Then, at the embassy we pull number 17 ticket to wait in line for our visa’s. Then, we’re sitting at the airport waiting for our flight when a runway zambonie drives by (number 17 pasted on the side). One more, on the way up the cable cars, hundreds of feet above the water with no support posts for like a km it seemed, our hands and feet are sweaty and we’re huddled towards the middle of the car, thankful to be alone, I glance out and look across to the cars going the opposite direction, and look at one car. You guessed it, number 17. That’s it, I can’t take it, but don’t share with Josh until we’re safely on the ground. We take the bus down for 17 hong kong dollars! Ok, stop it. 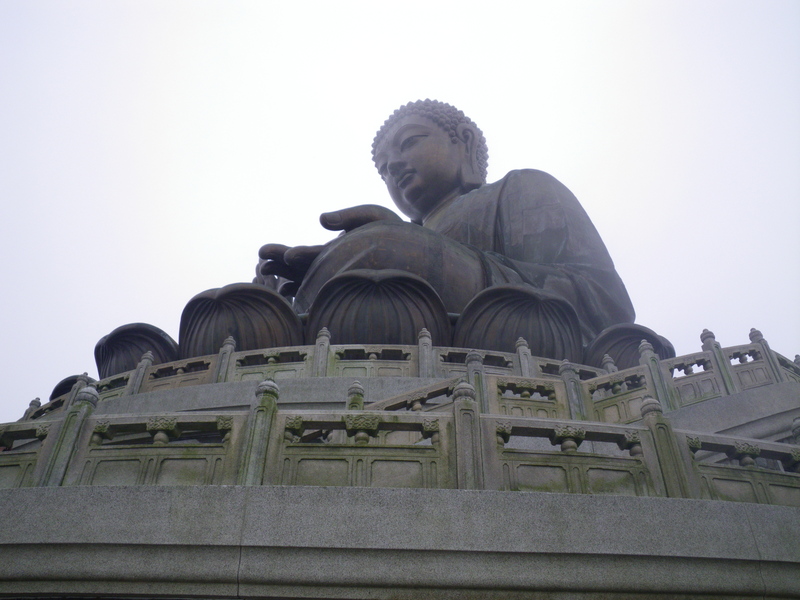 Anyway, we saw the giant Buddha on the top of the world, but it was a it foggy and smokin’ hot. We took our time up there, did some people watching, some photos, and grabbed a green tea frappacino. We thought we might try out our luck on horse racing, but the track was empty, at least no horses, so we opted to watch some rugby at the sports complex in the middle of downtown. So strange, but great for a sit down. For dinner we grabbed some glorified itchiban soup at Toast Box, before heading to the room to crash again. It’s tough to get past 830. Still haven’t seen the light show at downtown. Today, Mother’s day, found McDonalds quite busy. Everyone was dressed kinda nice, eating their hot cakes with style. It was a getter-done kinda day, only we didn’t. We spent some time at a Philipino internet cafe. It was packed with people calling their mom’s online back home, giggling ,and chatting amongst eachother, topped of with stiffling heat, a dripping AC unit, smelly food and aweful karaoke noise from the room beside us. A great experience. We did end up finding Star Ferry and relaxed for a while infront of the overwhelmingly large view of down town. More than 180 degrees wide. Crazy. We were trying to plan our next few days, and hopefully weeks, but not much luck, we left to take a walk in Kowloon park to think. Back to the internet, the travel agent, took a walk, waited, walked, and back to the travel agent. We booked to Bali online, found a hotel, and at least know what’s going on for the next 8 days. Further than that the train is booked. So we need another plan. A minor oopsies occured here when I ended up leaving our most important booklet with passports, visa’s, money, etc on the seat in the travel agent, but luckily we decided (after not booking anything there) to go back upstairs to ask another question. Sigh. I can’t believe it was there, with everything still in there, and thankfully we decided to go back up there less than 5 minutes later or we wouldn’t be going very far tomorrow. More luck, we found a power outlet adapter by fluke so we can finally plug in the peanut (laptop). Could it be that ominous 17 that is helping us out here? I’m not sure. We’re off to Bali tomorrow morning. Going out to see the amazing lights shortly.